Do your cakes collapse, soufflés slump, cookies crumble, and fruit pies fail? For those living at high altitude, baking can be a challenge at best, or a total disaster. More than thirty-four of the fifty United States, plus many Canadian regions, have cities and towns at altitudes of more than 2,500 feet, yet there are hardly any cookbooks that address the special needs of these local bakers. Until now. Award-winning cookbook author Susan G. Purdy has finally written the first-ever foolproof guide to high-altitude baking. Purdy has actually "gone there and done that," staying as long as it took to bake these recipes to perfection at five different locations -- and elevations -- across thecountry. 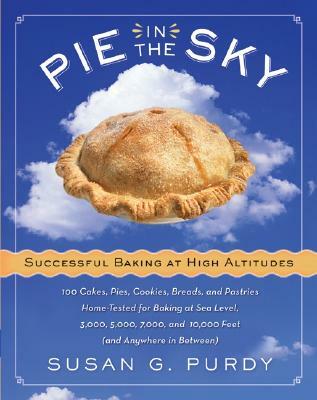 In Pie in the Sky, Purdy leaves behind old conversion tables, disproves many oft-repeated calculations and adjustments, and presents reliable recipes in their entirety for each altitude. She takes out the tinkering and guarantees success at any height. In addition, she explains the hows and whys, gives tips and hints for problems specific to every altitude, and generally demystifies the subject of atmospheric obstacles that cause favorite recipes to flop. Whether they live in the eastern mountains or the far west, in Boston, Massachusetts; Boone, North Carolina; or Santa Fe, New Mexico; home bakers as well as experienced chefs will love the wide range of easy-to-make treats including Mile-High Lemon Meringue Pie, Coconut Cake with Coconut Icing, Paradise Peak Chocolate Soufflé, Vail Lemon-Poppy Seed Loaf, Celestial Challah, and Sour Cream Streusel Coffee Cake. Every recipe was tested at sea level (Connecticut), 3,000 feet (North Carolina and Virginia), 5,000 feet (Idaho and Colorado), 7,000 feet (New Mexico), and 10,000 feet (Colorado) and can be used at these elevations or any points in between. Susan G. Purdy, CCP, is a well-known, widely traveled baking teacher, journalist, and author of thirty books, including twelve cookbooks. Her most recent works are The Perfect Cake and The Perfect Pie, as well as the IACP/Julia Child Cookbook Award-winning Have Your Cake and Ear It, Too.